China’s island-building campaign in the South China Sea has been happening at breakneck speed. At Fiery Cross Reef, the construction of a 10,000 foot runway capable of supporting fighters and military transports has finally been proven operational after China landed an aircraft on it. . Here’s why that’s causing great concern among nearby Asian countries and what could be done about it. This revelation came much to the chagrin of Vietnam and other local powers that also have claims on areas of the South China Sea, and the whole situation remains a hot topic on Capitol Hill. But the cold hard fact is that it was really only a matter of time before this happened. The Chinese used a non-military aircraft to make the inaugural landing; this makes sense. China has long claimed various peaceful purposes for its man-made islands, although scientific research and fish population studies surely don’t take a massive island building campaign that has done serious ecological damage, not the other way around. The truth is that these islands could be hardened military outposts capable of projecting power in a persistent manner far from the Chinese mainland, and over one of the most important shipping arteries in the world. It is all part of a scalable anti-access/area denial military strategy that China has been pursuing with great fervor over the last decade. So what happens next? Likely nothing. The Obama Administration only began seriously addressing China’s island building program in the South China Sea fairly recently, and although there have been direct calls by top Administration officials for China to end its island building operations and to resolve their South China Sea territorial disputes with their neighbors diplomatically, there is very little chance of this happening now. Additionally, just late last year the U.S. Navy made its first “freedom of navigation” passes by some of the islands, and American military aircraft have been challenging China’s rickety air identification zone around them sporadically over the last year. Neither of these measures have done anything more but set a precedent, which is relevant objective, but they also enraged China’s ever more belligerent power-apparatus and gave the Chinese press gobs of anti-American fodder in the process. U.S. Senator John McCain has been a loud voice in calling for more freedom of navigation exercises around China’s man-made islands, although it would be hard to argue that just executing these operations one after another represents any type of a clear strategy. China will deploy fighter, maritime patrol and surveillance aircraft, as well as anti-submarine and surface warfare helicopters to Fiery Cross Reef once it becomes fully operational. Other islands will also have helicopter and/or major aviation facilities as well as multiple facilities and runways are under construction of varying sizes. China has already deployed J-11 Flanker derivatives to Woody Island in the Northern part of the South South Sea. 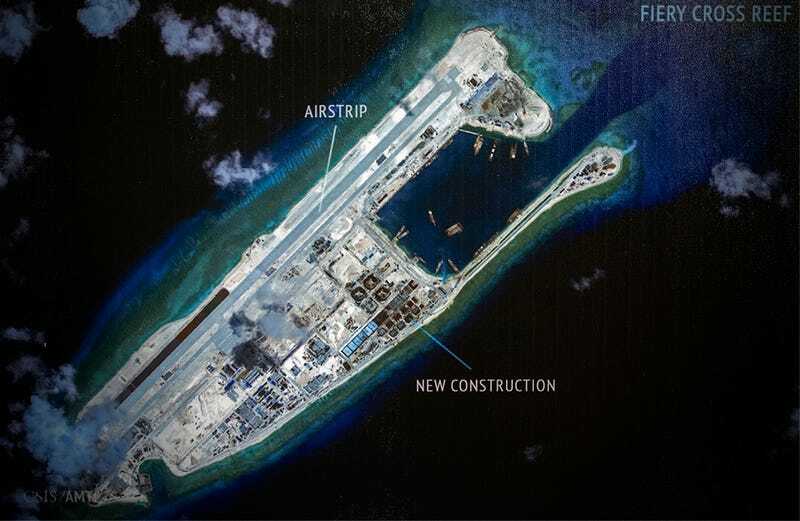 Fiery Cross Reef in particular, which has the largest runway, will also likely become a refueling point and forward operating base for China’s long-range bomber aircraft which have pushed out farther and farther from the Chinese mainland in recent months. All these islands will also support China’s increasingly potent Coast Guard and Navy armada that already has a notorious presence in the region. Long-range anti-ship and surface-to-air missiles systems will also likely show up on these islands in the not so distant future. Once operational, China can create a anti-access canopy over a massive portion of one of the world’s most vital shipping lanes. Fishing and energy reserves are also major motivators for China’s claim on this territory and a very good reason to enforce it with hard military power. With every move China makes in the South China Sea, neighboring countries react. An arms build-up is actually already occurring in the region. This will only increase once China’s capabilities become realized in an operational manner, but what can the U.S. do? Just attempting to increase naval patrols in the area would be a weak solution. One could argue that presence needs to be met with presence, and that the U.S. should deploy a sea base to region to counter-balance China. The Pentagon has the technology and capability to do this, in fact they have had it for decades. But now sea bases have become weapons systems unto themselves, a far cry from the improvised versions that saw action in Vietnam, the Persian Gulf during the “tanker wars” of the 1980s and in the Persian Gulf today. Today this capability is realized through a number of technologies and weapon systems. The geriatric USS Ponce was refitted to become a sea base for mine operations, special operations and other needs in the Persian Gulf, but now the Navy is bringing online its new Mobile Landing Platforms (China is developing similar systems as well), and one configuration, which is now dubbed the Expeditionary Mobile Base, is setup for precisely this type of mission. The USNS Lewis B. Puller is the first of these ships, and although it is slated to takeover for the USS Ponce in the Persian Gulf this year, it could be diverted to the South China Sea. The second ship of the same configuration is under construction now and it will be delivered the Pacific’s 7th Fleet well before the end of the decade. Setting up a sea base in the South China Sea would likely be viewed as extremely provocative by China’s. It would also put America further in between a nasty disagreement between an emerging super power and smaller countries in the region. Yet at the same time it would set a precedence for presence in the region, which may viewed as a goal unto itself. This cannot be achieved by America’s aircraft carrier fleet; the U.S. does not have enough of them, and temporary operations in the area do not send the same strategic message as a sea base. There would also be a cost to such an operation. Although not anywhere as crushing fiscally as a major air campaign or a ground operation, funding a permanent presence anywhere is not cheap, even if it is on a boat. But if we have the capability that is specially built for this kind of operation, and more peripheral capabilities that will make it all that much more effective on the way, using it in a strategic “chess move” at this critical time may make some real sense. Additionally, other nations in region who have a vested interest in keeping China’s South China Sea ambitions in check could pitch in. Not just with money, but fuel, ships and helicopter detachments. Alternatively, the U.S. could continue with what it is currently doing: sailing a carrier strike group through the region sporadically, training with nearby allied nations and executing freedom of navigation drills every now and then. The only issue is that once China militarizes its islands they could shut down air and sea traffic in the region on a whim. Unless the U.S. is willing to then send a force to challenge such a volatile situation, the ball will be deeply is China’s court. The U.S. could also increase its forward deployed forces to the region. Today the U.S. has a Littoral Combat Ship deployed to Singapore and the Navy hopes to increase that number to four by 2018. The only problem is the LCS neither provides the persistence of a sea base, nor the combat capability of a destroyer. The LCS presence alone seems more like a token force than a serious deterrent. Subic Bay Naval Base in the Philippines, an icon of the Cold War, may be reopened to forward based U.S. Navy ships in the coming years. This would offer dramatically improved access to the South China Sea compared to Singapore, and forward deploying a portion of the Littoral Combat Ship fleet destined for Singapore to Subic Bay would enhance U.S. presence in the region. Having a couple Destroyers stationed at the base, similar to how the U.S. has done in Spain, would be ideal, although such a move is unlikely due to demands for these ships in other places and the cost associated with forward basing them for the long term. And once again, this is only a possibility at this point. The synergistic effect of Littoral Combat Ships combined with a Sea Base and sporadic larger Navy drills in the area could be a winning cocktail that could really keep China on its heels and give the U.S. a flexible and rapidly scalable set of capabilities right where it matters most. It would also be comparatively cost effective. The real question is, how much is the South China Sea and its critical shipping channels, as well as backing up the U.S. allies in the region, worth to the U.S.? Is it worth putting Americans in danger in yet another far away land, even in small numbers? If the answer is yes, than a sea base is probably the most efficient, effective and politically benign way of doing so. Regardless of if or when a military application is put into play as a response to China’s South China Sea ambitions, intense diplomatic engagement now is needed. China’s economy is increasingly flagging. Getting serious about introducing trade penalties if they proceed with outfitting these islands military would be one option, but there appears to be little will in Washington to pursue such a policy. In fact, a sea base is probably more likely than intervening in the “unique” trade ecosystem between the U.S. and China. Yet the longer the problem is neglected diplomatically by the U.S. the harder it will be to solve down the line, militarily or otherwise.